The booklet to this disc refers to the performers as being members of a group who have “bravely worked to restore the dignity of one of the most important of Italian musical traditions”. Although it is related to the folk instruments of many other countries, the sound of the mandolin, especially when encountered in groups, is immediately evocative of Italy. Few arrangers of Italian songs manage to resist its inclusion for long. This disc goes one better, by having an orchestra of up to twenty-five players, nearly half of whom play the mandolin, the rest playing lower-pitched instruments of the same family, together with guitars, harp and double basses. The resulting sound is distinctive, albeit reminiscent of a balalaika orchestra. 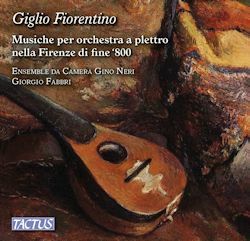 The music included here is mainly by composers associated with Florence in the nineteenth century. Despite the unity of instrumentation, date and nationality of origin there is attractive variety in the music. None could be described as a musical revelation but provided expectations are not set too high there is much that is likely to give pleasure. Usually the title of the pieces gives a very good idea of what the music will be like. Enrico Marucelli’s Capriccio Zingaresco is a typical “gipsy violin” piece but played instead on mandolins, while his Patrol is as dull as every other piece of that title. Carlo Graziani-Walter’s Dante e Beatrice is suitably romantic and Carlo Munier’s Preghiera is suitably prayerful. The one surprise was Carlo Munier’s four movement Quartet, a Suite of succinct but very pleasant miniatures. All in all this is a very pleasant and well recorded disc, with limited musical ambitions but with those ambitions wholly achieved.